Are the groups actually different? What are the features that best describe the differences between the groups? In an experimental context this means determining whether control and test samples are different, and identifying the (known, quantified) experimental variables that contribute to that difference. PLS-DA is based on PLS regression (PLS-R) with the Y variable generated from experimental group membership, mapped into a linear space. In a 2-group experiment this can be as simple as 0 and 1. The implementation of PLS we will be using is provided by the scikit-learn library. We will also be making use of matplotlib for plotting our outputs and pandas for some basic data handling. For this demo we will start with 1D 1H NMR data as it makes explanation and visualization of the PLS models easy to understand. However, later we will also generate PLS-DA models for other data types, to demonstrate how you can easily apply these same methods to any type of multivariate data set. Before starting, let's take a look at the data we are working with. Create a new Jupyter notebook using the Python 3 kernel, and in the first cell enter and run the following. This will import all the neccessary libraries, as well as using the %matplotlib magic to display output figures in the notebook. We will start by loading the data. 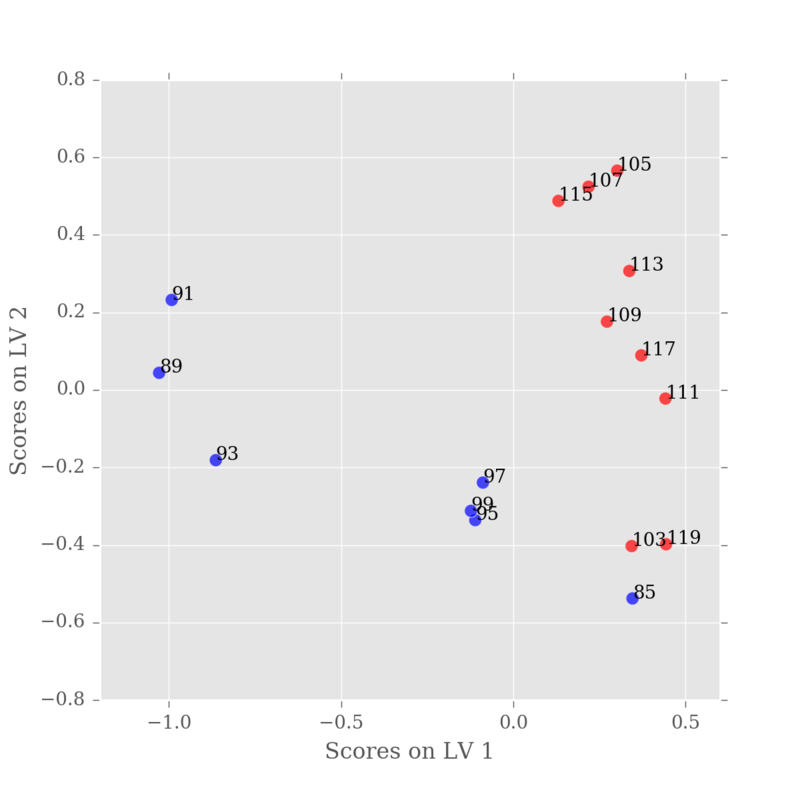 The source data is provided in CSV2 format with experimental samples along the horizontal axis and spectral variables (ppm) along the vertical axis. In addition to the a sample number, there is also a sample group (class) from the experiment). There are many ways to load this data, but using pandas allows us to keep the elements of the data together nicely. Let's plot the raw data to begin with to get an idea of what we're working with. We can use the build in pandas plot functions to do this quickly. 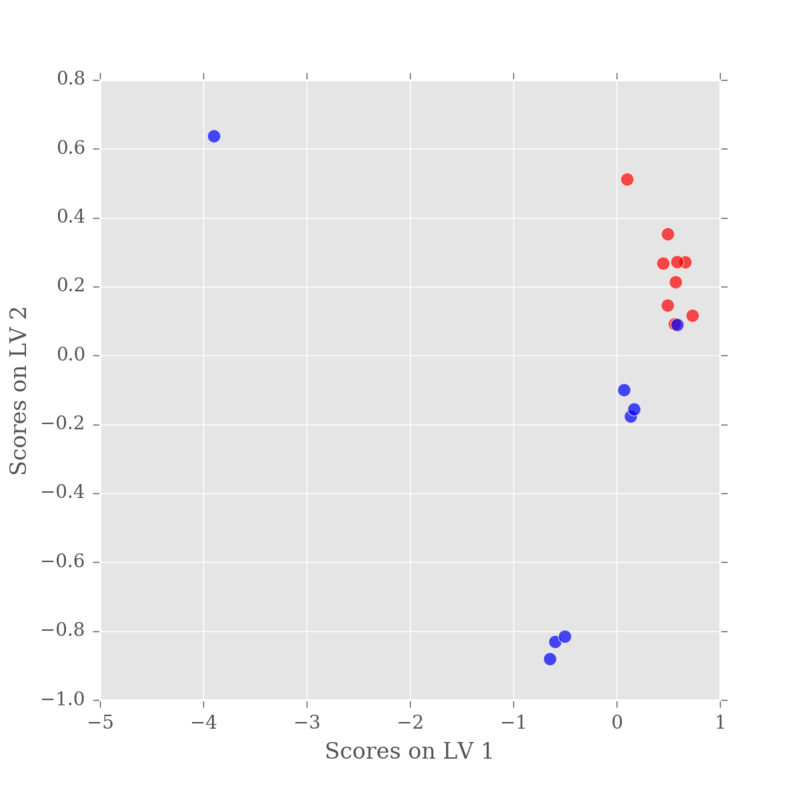 If you look closely you'll see most of the samples look very alike, but there is one (in red) that looks very unusual. This will become important later. As this is basically a list of values ("N" or "H", one for each sample) we can use this, together with a dictionary colormap, to plot samples from each group in a single colour. Now we can see that the dodgy sample is from the "H" (blue) group. Let's now perform the PLS-DA. As already described, to do this we need to create a pseudolinear Y value against which to correlate the samples. Since we have only two sample groups we can do this very easily. Next we convert the boolean values into 0 and 1 by setting the dtype on the array. If you have more than 2 groups, but want to perform a similar 2-group analysis, you can filter the DataFrame using Pandas indexing. Next we apply fit a PLS-DA model to our data. We must specify the number of components, or latent variables (LVs), to use for our data. We select 2 components, with autoscaling off. The algorithm expects data to be in the transpose, with samples in the horizontal axis and features in the vertical. In contrast, the weights describe the contribution of each variable to each LV. You can view the shape of the weights as follows. Again there are 2 columns, one for each LV and 383 rows, one for each variable. You can remove the .shape to see the full list of data, but it's rather long. This isn't very enlightening in itself so lets plot these values. Again, we'll generate a DataFrame to simplify the plotting. As samples are in the rows in the scores array, we assign an index from df.columns. 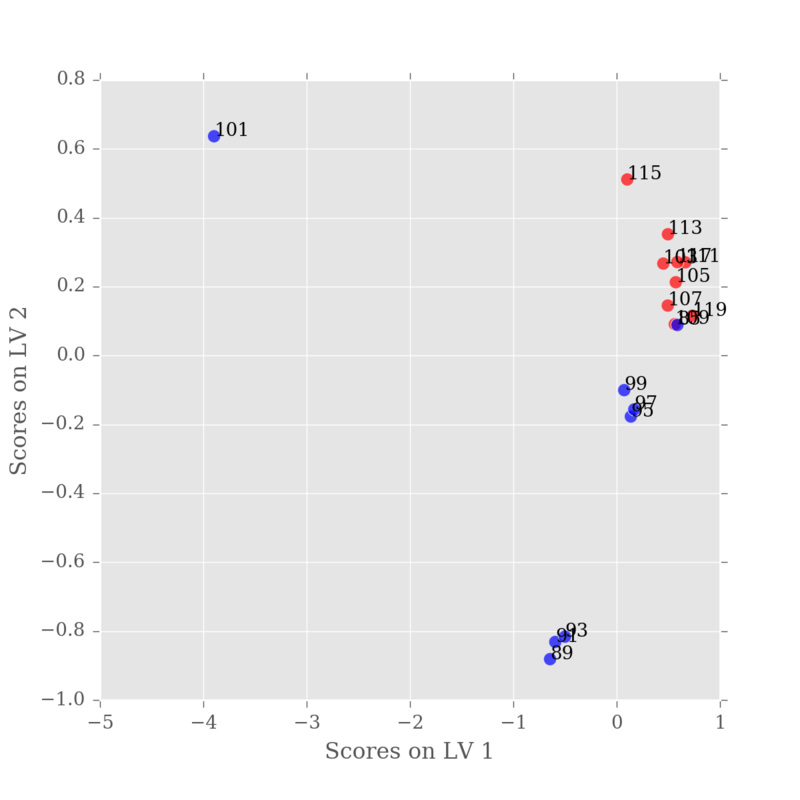 So we have good separation between our sample groups, however it is in LV2. While practically this has little effect, the fact that the major variation in our data is not between our sample groups is a little alarming. Remember, PLS-DA is a supervised approach, whereby the algorithm is specifically tuned to find the difference beteen the groups. So, what is happening? If you think back to when we first plotted the data, there was an ugly looking sample in the dataset — a blue spectra that was very different to all the others, with artefacts and bumps. The variation in this sample is so large that it is swamping the difference between our samples. So, which sample is it. Let's look at the scores DataFrame. Iterating over scores.values would return a tuple of values, one for each column. This means we can do for x,y in scores.values: to get the x,y values. However, we also need the index (row) in order to get the label for the sample. To get an index, we wrap the scores.values in enumerate. Each loop generates a tuple, containing the index and the tuple of x,y which is then unpacked by (n, (x, y). Now we know which sample is causing the problems, let's remove it. We can do repeat the analysis so far, with the excluded value. Note that we also need to update the colormap. Let's plot the PLS-DA model built using filtered values. This looks a lot better, the majority of our variation is now in the first latent variable. You'll notice that one of our samples is still mis-classified, but that's just science. As there is nothing objectively wrong with this sample, we just have to accept that our experiment wasn't perfect. Supervised models are built using prior knowledge about important sample features — for example, membership of experimental groups, or secondary descriptors. Comma Separated Values is a basic text file format where individual values in the file are separated (or delimited) by commas. Tab Separated Values (TSV) is another common format using tab characters instead.